This is what I'm wearing to a MUA event tonight, bit nippy so I'm also wearing a long sleeved top underneath because sometimes its not worth suffering for fashion. 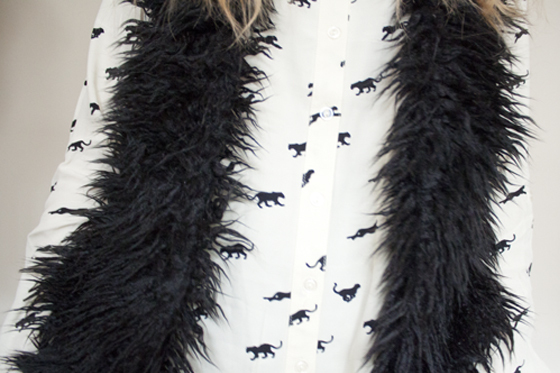 I'm totally in love with this panther print shirt! Its a size 12 as all other sizes were sold out, it feels absolutely massive on me! The sleeves are so long I have to roll them up a bit, but they do feel pretty cosy like I'm wearing a boyfriends shirt (heh as if, single ladiez). I feel like all I wear at the moment is a variation of the leggings shirt/long top/tunic and flatforms combos. I really need to branch back out into dresses and skirts, but at the same time the shops right now really dont excite me. Im really dreading spring summer right now! Also I hit a whopping 12000 GFC followers on here, Still a massive shock to the system for me that I even have one follower let alone however many I have nowadays. I try not to mention stuff like this as it does come off braggy, regardless of me trying to say Im not bragging (which Im not, but you catch my drift?). But big thank you to everyone who chooses to follow me and continues to support me and my blog! I really wouldn't have the opportunities or the life currently I have without you guys, Just wish I could really show how thankful I am, without coming off insincere, braggy or full of myself! Im not one to gush, but I really am thankful. I've always seen myself as "the Primark of Fashion Blogging" as my blogs alot faster/relatable/obtainable than most Fashion blogs out there. But my readers are the ones that make me feel like I do have some relevance in blogging and I should be proud of how far my blog has come since I started in 2009. Your hair looks abs. lush! Congrats on getting 12000! You look great! lovely shirt :) and it has such a great pattern. Really like your shirt! I tried on a stag print or some other animal from h&m but I looked like a bit of a nutter, just couldn't pull it off at all! It's a pleasure to read your blog so keep yor posts coming! Enjoy the MUA event also. sad you couldnt come milly! yeah i thought it was a bit different fromthe birds or horse prints that seem to be in this sort of style! the panther print is gorgeous! I find it so difficult to stay fashionable and warm sometimes! I've had way too many fashion related colds, so i see where you're comin' from! You look lovely Lily, I hope you have a great time at the MUA event! hope you managed to nab it! i love the necklace even though its tarnished so quickly! awh thank you so much! i feel the same as yoiu about the shops,im drawn to winterwear but there is no point as its coming into s/s now! Lovely outfit, that shirt is amazing shame it's out of stock I'd totally buy it. I love how you've styled your hair in this post as well. You look great! was pretty much out of stock when i bought it as they only had one size! thanks! I know what you mean about shops at the moment, not much is grabbing my eye! I look at all the pastel colours too but not sure of how I can pull it off, eh well.. :) Lovely printed shirt, have fun at the MUA event and Congratulations on 12000 followers, what an amazing triumph! its all a bit blah i think,i havent seen anything in ages and though "gosh i need this in my life NOW"! thank you! 'The primark of fashion blogging' haha! tbh that's why your blog is so good, it's actually relateable, anybody could look stylish wearing disco pants and JC litas but your blog is fab cos it shows if you have actual style you can look just as good with cheaper high street clothes, love your blog lily :)! haha that was actually a hater comment i once got but i actually really like it! thanks! That blouse is absolutely adorable! So happy for you reaching such a milestone! The shirt is beautz! Congratulations of the 12,000 Lily, that's bloody amazing, you do deserve it though! i prefer my office ones, but thats because i prefer the style of them. the asos ones are nice though i dont find them hard to walk in. I find my H&M ones the most comfortable out of them all though! Lovely outfit! Can't beleive your single you gorgeous woman! And congratulations on 12000 you totally deserve it! Ahhhh that shirt is amazing!! That top is adorable! And that fur vest makes everything look so comfy. Also, Congrats on 12,000 followers! That's amazing Lilly! Love your shirt!! YAY Panthers!! I love your hair in this post! Congratulations on hitting 12000 followers, you deserve them all! how beautiful! i love the nails, i have one in the same colour, its just fab! ps: your hair looks amazing!!!! i really wanted a bird print one! might have to investigate! love your make-up so much! I don't think you'd be bragging or something like that, I think it is actually very nice of you saying thanks to the people who read your blog! Congrats on all the followers! You were the one to put the work and commitment in though, we just appreciate it! awh thanks! but without people engaging with what i post it wouldnt mean half as much! Really like the chic combo of your outfit then contrasted with the spiked necklace. Congrats on reaching 12000 followers - looking back at your first few posts you have come a long way! Love the top and the nail varnish color! Loving your blouse, animal prints are so cute. awh im glad you like it and are inspired by my blog! it means alot! I love the monochrome look. I'm quite envious of your gorgeous fur gilet, it's so amazing. Congrats on the followers, it's not hard to see why you have so many- you're blog is beyond amazing. I hope you keep on going because you have such a wonderful blog and seem so brilliantly lovely. This is so pretty :) Ahh, congratulations on 12000 so inspirational. Your blog is amazing and the only one I actually follow religiously hehee. awh bless you! thankyou so much! Lovely outfit and congrats on the 12000 followers! You deserve every single one of them. Congratulations on the GFC followers! That's such an incredible amount and you definitely deserve it! Haha awh thanks! I love baby glitter (and louise of couse!) so much! Love the print on the shirt, it's adorable. Neon pink is my favouirte nail colour ever! baby stepping towards the pastel colours for s/s though! thankyou! Congratulations on hitting 1,200 followers - that's bloody brilliant :) and very well deserved! saw on twitter you now have it! woop! Thank you! Congrats on all the followers, that's a huge milestone that I can only dream of! Also just wanted to quickly say I'm in love with your ASOS shirt. Animal printed patterns have my latest obsession. just prooves anyone can make it if you keep going! Thanks! Congratulation on hitting the hugest number of followers darling, it shows what a fabulous blog you have. Love this outfit and your hair is so pretty. it was sold out in my size too but i think its now sold out offically, its really lovely and im glad ive got it! 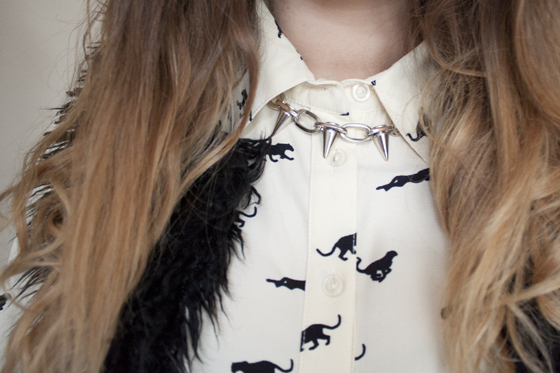 Cute print, love your spiked necklace too. Congratulations on the followers! Lovely post! Panther shirt is gorgeous, definitely a must-have! So jealous of you going to all these events! Love the shirt so much, are these AA Disco Pants? Trying to decide whether to invest in a pair, but £70?! Please can you check out my blog, just starting out! No they are just the regular AA leggings, Disco pants dont suit me at all! WE LOVE UR ENSEMBLE !!!!! PS CAN WE FOLLOW EACH OTHER ? Loving anything cat related so very good choice! Defo just looks like its "oversized" the shirt so don't worry about it. Also need the crucifix bracelet in the last post too.